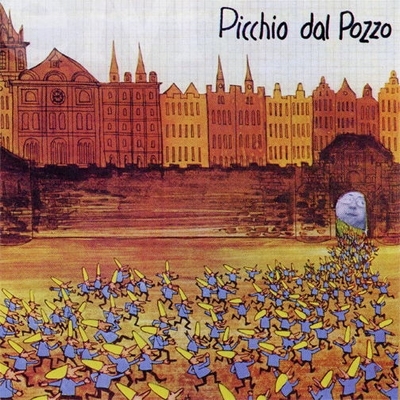 A wonderful release that has always kept me on my toes and been quite an inspiration, Picchio dal Pozzo's self-titled release is a hidden gem in the Canterbury scene, filled with inspiring lines and one of the most wonderful psych tracks these ears have come across. Although perhaps not as essential as Gong's most famous of works, this is wonderful material. Essentially, I am drawn to this album from the psychedelic Seppia, which has a groove for about 4 minutes that I quite simply call the coolest groove ever. Man, is it fun. Think of it as a musical high, with cosmic influences and effervescent vocals and a pounding distorted line that you can't help but move along with. This differs quite much from other famous Italian works and so it should be noted as soon, as this shares much more connection to bands like Gong and the like than it does to Le Orme, Museo Rosenbach, and etc. The variety of instruments, stunning effects, and sense of style are more than enough to make this record something to hold onto. I can almost guarantee that those with a love of Canterbury and an ear for experimentation will be enthralled with this release. Give it a try, I'm sure you'll be impressed.